Innovation is the main reason why business succeed. Why? Because innovation means change and if you embrace change, there’s more chance your competition will become obsolete. 2. Experience. Being involved in the same industry or the same company for several years is a formidable trap. Just take the time to think of the most innovative companies in recent years. How many innovations are “homegrowned”? Think of Tesla, Uber, Go Pro. Why leaders in these industries (IE. GM, Taxi Cies, Canon) are not THE innovators? Because we all live with paradigms! 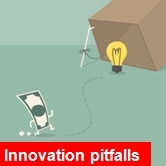 ← Innovation: It’s not about processes & tools!